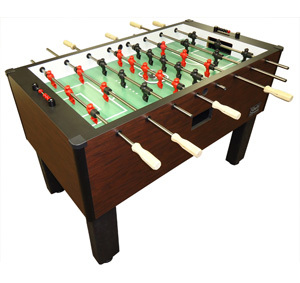 We are the industry's choice for professional, competition quality foosball tables. Improve the game, by playing on the Shelti table. Made in Michigan. Designed for competition level players and recreation locations. All Shelti foosball tables feature the materials, construction and durability found in commercial use tables, including; solid-core legs, centerless ground urathane balls and patented Shelti counterbalanced man. Additional options include special orders for custom laminates, and chrome finish or our unique high performance Stainless Steel QPQ™ treated rods.